Heavy Planet : Album Review: Mother Corona - "Out of the Dust"
Album Review: Mother Corona - "Out of the Dust"
Early rock and roll of Fifties America influenced the youth of Britain who eventually overwhelmed the music world themselves with the British Invasion of the sixties, inundating radio waves and album sales with new, fresh, exciting music that was a forerunner of massive change in the worldwide culture of man. The British Invasion’s music legacy still rings loud and clear today as music from the Beatles, the Rolling Stones, Black Sabbath, and so many others can still be enjoyed as everlasting masterpieces. But the seeds were sewn with the tremendous music of 50s America, music that begat change, inspired a generation, and lit the ignition to a musical explosion of incalculable proportions spanning continents and generations. There are plenty of indications, most notably in the number of bands now in the UK playing variations of stoner, doom, and psychedelia, that select American rock music from the 70s and the 90s has sewn its own seeds, adding to a groundswell across the pond that is just now beginning to burgeon into something significant, something hopefully steadfast and powerful, something that can add to a worldwide development of the ‘good stuff’, music that is real, enjoyable, massive, that has taken the essence of those two rock eras and suffused it with newness, creativity, and sheer volume of both decibels and choice selection. No place represents that uprising better than the warrior islands of the UK where a large number of bands are creating, playing, and producing music that is the sole reason rock n’ roll has not yet died a death of ennui brought about by the decadence of a single controlling voice for what gets played to the masses. 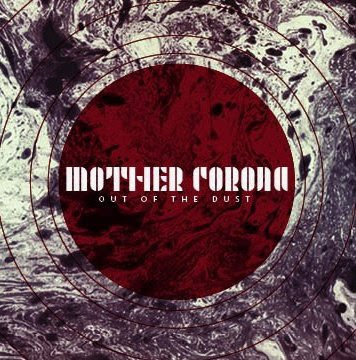 Today’s spotlight falls on one of the highlights of the stoner/psychedlic groundswell with the superb band Mother Corona, who this past April released their first full length LP, “Out of the Dust”. The band consists of Lee Cressey on guitar, Rob Glen on bass, and Dave Oglesby on drums and vocals, a three piece band that creates a whole lot of magic without a whole lot of help. I suspect one of the keys to their beautiful renditions is the simplification in instrumentation, a formula most bands follow whose music makes its way to our site, keeping the music simple, clean, and raw, where distortion is in the amplification of one guitar, where the frequencies aren’t over-mixed to confusion, and nothing gets drowned out by over-instrumentation. Mother Corona plays stoner music to the maximum, incorporating the very best of the low frequency, fuzzy distortion that is the hallmark of the genre. They incorporate quite a bit of Dozer in the way they structure their music, the best Dozer stuff, the “Coming Down the Mountain” Dozer. The “Trail of a Comet” and “Madre de Dios” Dozer. There’s quite a bit of Firestone, Truckfighters, and early Freedom Hawk in there as well, not to mention some Astroqueen. What they really sound similar to, which is a great thing, are their fellow UK upstarts Steak, Enos, and Trippy Wicked & the Cosmic Children of the Knight. Make no mistake, though, these guys carve out their own superb, face stomping, diesel fuel burning inter-continental ballistic mayhem filled with huge, powerful, balls to the wall sound that drives hard and deep without relent. These guys have been kicking it around since 2006, trouping down the same roads as their warrior isle compatriots, building up a grassroots following by playing in bars and taverns with the occasional gig opening for better known acts that weren’t better acts. This is the typical story. What’s not typical is their music. While it is derivative, it is also unique, a result hard to engineer to say the least. Their music sounds like what you love while not being a copy of anything else you’ve ever heard. Oglesby’s vocals are reminiscent mostly of Alice in Chain’s Layne Staley, but are uniquely suited to Mother Corona’s loud and abusive music, setting the tone perfectly on each song and carrying its weight in instrumentation throughout. At the same time for Mr. Oglesby the drumwork is mighty and fierce, doing more than the typical requirement of keeping the time by relentlessly driving the music forward with panache and heart. Rob Glen’s bass adds a stout component to the melodies and pace of the music with a thunderous, raucous, and raunchy delivery filled with passion and skill. The guitar of Lee Cressey is adept, masterful, wonderful, and wild. He takes it places that induce wonderment and deep satisfaction, plunging into the darkest depths of distortion and soaring to the heights of psychedelic stratospheres. Blended together these 4 instruments deftly and expertly rendered by the 3 musicians of Mother Corona combine to form some of the finest stoner/psych music of a generation. The six minute track “Hedonist King” starts off the album and immediately sets the tone with some trippy guitar to go along with the energetic drums of the opening seconds. Vocals become a focal point quickly into this funky, fun tune where “ . . . dancing in the rain, drinking in the sun . . . “ sets the tone for a hedonistic trip replete with groovy riffs, head swinging bass, and chunky, heart pounding drums, overlaid with sing along vocal decadence. “Sunscope” brings the fuzz, hot and heavy, relentlessly rendered by both guitars in a display of power, with primeval solos delivering long, satisfying salvos of chest thumping dynamism in over five minutes of a superb specimen of stoner rock music. The third track gets to showcase an opening with strictly bass and light, acid induced guitar work dancing above, along with a bit of cymbal spangle to accentuate the deep distortion that is strictly a setup for the booster engine explosion that becomes “Sonic Tomb”. The pace is fast, the effort is maximal, and the sound is deep and brutal.The listener becomes the poor ringer slated to fight the champ and gets round after round of constant jabs and right hooks, each heavier and more fierce than the last, relentless in delivery, and somehow beautiful in ferocity. “Cosmic Collisions” at number four comes in at seven and a half minutes of deep, dark, distortion, low, slow, heaviness pouring through every crack and crevice until you are filled to the brim with big chunks of fuzz. Steady all the way through but overlaid with cloudy riffs and foghorn guitar solos, this song is the megaton meteorite from space that has punched a hole in the atmosphere before cratering the landscape with its sonic boom of distortion. Track 5, “Qualuude 74’ “ is another low, slow fuzzbomb with a beautiful tempo within each stanza that leads into chainsaw choruses before giving way to a series of skillfully rendered solos, along with athletic and powerful bass riffs, and finally leading into a final but urgent stanza and chorus set. The lyrics are a longing for an old favorite in recreational mind and mood alteration, qualuudes, a prescription medication no longer available but fondly remembered for its effects. “V.A.G.” gets my vote for favorite song. Not necessarily best, because they are all superb, buy my favorite nonetheless. It has a classic tempo, upbeat and pure enjoyment, striking that primal, tribal chord that triggers movement from deep down, exploding outward in a shiver of sparks and energy. It is a short treatment but packs a mighty wallop of fuzz and fun. It is primarily an instrumental with a short vocal set brimming with intense delivery. Riffs and solos abound, drums are intense and insistent, the bass as primal as the rhythm. Number 7, “Nuclear Winter”, is an eight minute treasure that strikes a chord somewhere between nostalgia and yearning, conjuring all the best music of eras gone by while promising the best of what’s to come. This song leans toward the psychedelic with a trippy trek that meanders through the minstrel waters of early seventies Steppenwolf while towing high tech equipment utilized to the max by the guitar solos of Lee Cressey, rhythmically driven forward by the scull-like strokes of Oglesby’s sticks as he croons beautifully that it’s “ . . . oh so cold . . . “ Perhaps this is the best song on the album, no one would argue the point I’m sure. The title track is number 8, an up tempo fuzz bomb that sets a livlier tone than the majority of the songs on the album while still unleashing furious and heavy nap and pile gutiar work. The song ends at about the 4 minute mark, but leads into a hidden jewel after 2 minutes of silence. After the 6 minute mark Mother Corona lay down a beautifully rendered ode to the fathers of stoner metal and fuzz rock music, Black Sabbath, by playing “Into the Void”. It’s not Ozzy and Tommy, but Dave, Lee, and Rob do a superb job of covering the song, putting as much into it as they do their own stuff, which is a considerable tribute from a trio of musicians that play music at its best to one of rock’s biggest legends who can certainly be considered as one of the all time best.